Episode 10 of Inside BU Hockey features Bernie Corbett’s interviews with Head Coach David Quinn, sophomore goalie Matt O’Connor and former Terrier assistant captain and current Islander blueliner Brian Strait (photo). 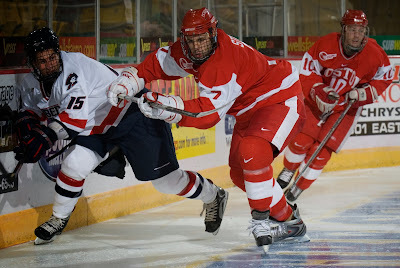 Prior to BU, he played two seasons with the NTDP program, under former Terrier John Hynes. In both years, Strait played for Team USA in the World U18 championships, captaining the team to a gold medal in 2006. Scranton. In early 2013 he was acquired by the Islanders and immediately assumed a regular spot in the defense corps. ►The NCAA has announced the sites of the four Frozen Four tournaments following 2014 with the Boston and TD Garden selected as the site of the 2015 tournament. Hockey East and TD Garden will host the event on April 9th and 11th. Sites for the ensuing three years: Tampa (2016), Chicago (2017) and St. Paul (2018). Boston most recently hosted in 1998 and 2004. In the early seventies, the old Boston Garden was the tournament site three years in a row: 1972, 1973 and 1974. In 1972, BU blanked Cornell, 4-0, to complete back-to-back championships. The Terriers were back in the Garden in 1974, but lost in the semis in overtime. BU first played in the Final Four in Boston in 1960 when the event was held in Boston Arena, now called Matthews Arena. BU is the only Hockey East school to win a national championship in Boston. Kevin Shattenkirk’s third goal of the season, a power play slap shot late in the final period, was the game-winner as St. Louis edged Winnipeg, 2-1. David Warsofsky’s second goal of the season was the game-winner for AHL Providence in a 3-2 win over Portland. The HockeyWriters.com examined five Team USA players to watch in the upcoming World Junior Championships, including 2014 recruit Jack Eichel.